Solo Table Ware SCCHB12BJ7234PK $20.50 Heavyweight dinnerware features a clay coated, paper construction to prevent sauces and liquids from soaking through. Deep well geometry adds strength and helps protect you from spills. Disposable dinnerware is made with a high percentage of plant based resources to reduce the impact on valuable natural resources. 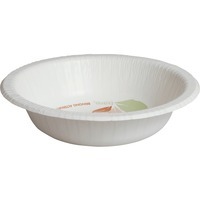 Paper dinnerware is perfect for use at company gatherings, special events, parties and more.